What a week it has been in the world of Stampin’ Up!. We are in the thick of Christmas cardmaking classes and workshops, a 25% off stamp sale and then BAM… we get news of the exciting Online Extravaganza sale that begins at midnight tonight. Well, as exciting as all that is, I couldn’t resist taking time out to join in this week’s CASEing The Catty blog hop. The theme this week is the delicate and delightful Fancy Frost section of the Holiday catalogue, on pages 36-45. Fancy Frost is described on page 36 as “Delicate medallions paired with elegant dry-embossed designs”. Oh my. How gorgeous is this? In particular, I was drawn to those adorable cupcakes with the fringed silver ribbon from the Glitter Ribbon Combo Pack. Is that not the cutest cupcake topper ever? 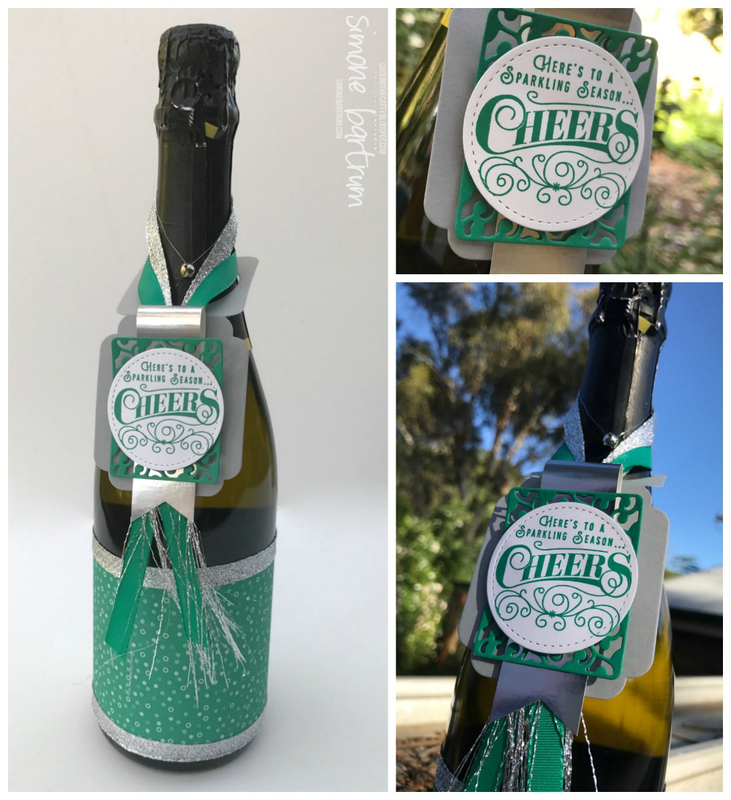 Just wrap a length of ribbon around a toothpick (make sure it’s secured firmly – I’d even get the hot glue gun out for this one), and snip away the sides of the ribbon. The full length of ribbon will then naturally fray, leaving you with this delightful array of glittery and sparkly thread. 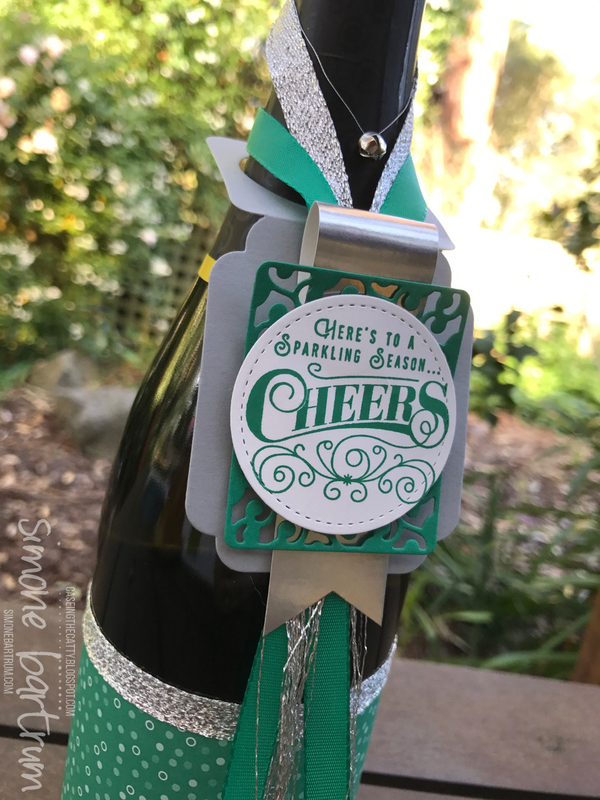 It features the Here’s to Cheers stamp set and Cheerful Tags framelits dies. 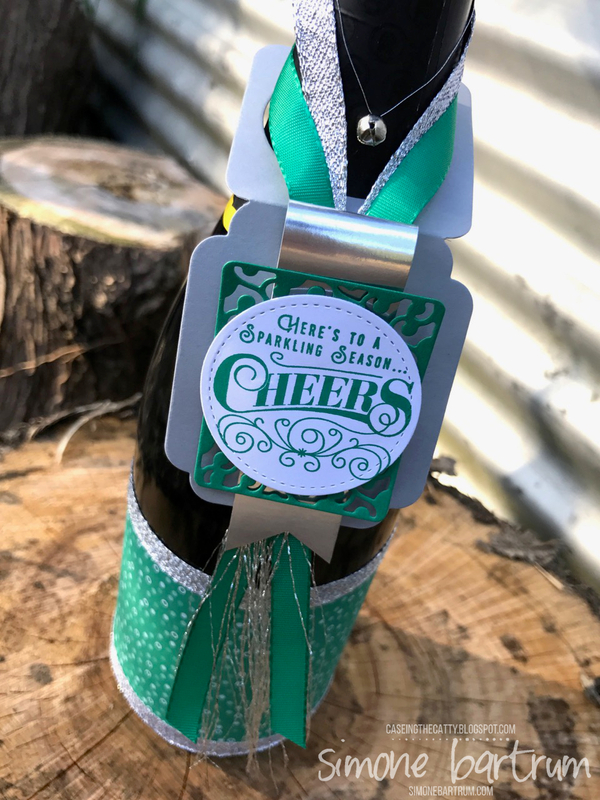 The bottle tag and bottle wrap is all decked out in Emerald Envy and Silver. Just a little festive and a little celebratory. Summer is just around the corner (we’re in Australia remember) and it’s time to start thinking about Christmas parties and end-of-year barbies (BBQ’s) with friends. 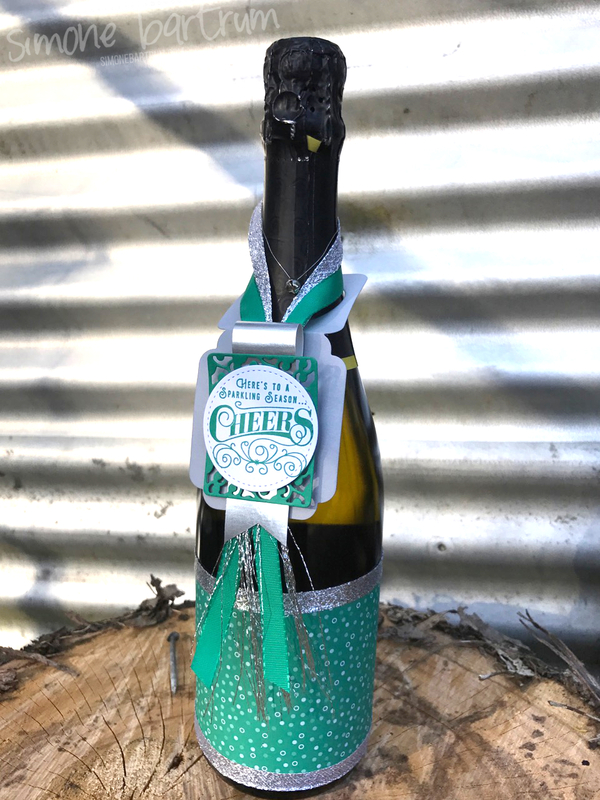 We usually bring a bottle for the host, and this is such a fun way to dress up a bottle. It doesn’t have to be wine or champagne. 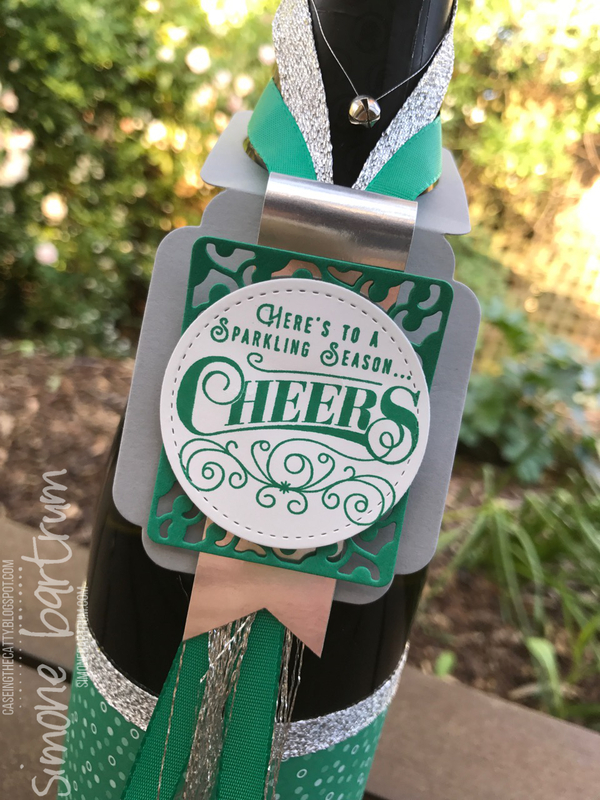 There are all kinds of bottles (oils, vinegars, cordials, mixers, etc) that can be spruced up with the bottle hanger from the awesome Cheerful Tags Framelits dies. Hot tip: This is one of the items that will be heavily discounted tomorrow when the Online Extravaganza begins! So there you have it from me this week. A little bit of fun, dressing up a bottle. There’s more inspiration ahead as we continue on the CASEing The Catty blog hop this week. Carry on and you’ll arrive at the lovely Judy May’s blog. Her Sweet Sugarplum creations are adorable! If you get lost along the way, just click here and you’ll be back at the CTC Blog. Wow, your bottle decoration looks amazing, Simone. I love the colour combo with the touches of silver. It looks elegant and festive. Thank you Judy! It’s an interesting colour combo isn’t? I haven’t used Emerald Envy and Silver together, but I think it looks quite striking.